The Village of Estero Design Review Board meeting of December 14, 2016 examined the project presented by Estero North Point Ltd.
Estero North Point proposes to construct the core infrastructure that will serve the future development parcels within the approximately 100 acre Estero North Point site. 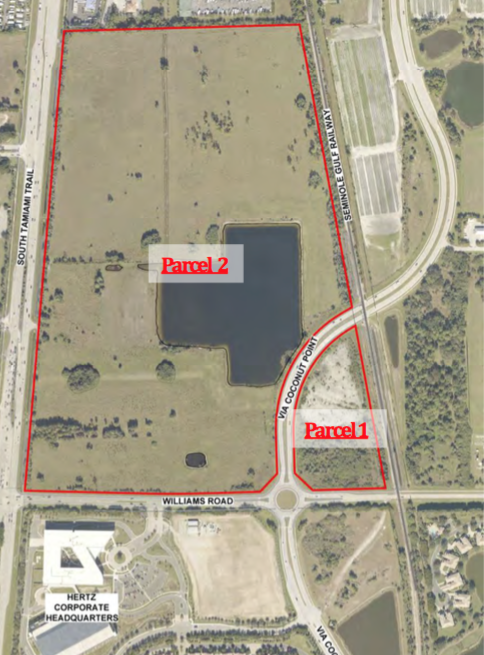 They are proposing a main entrance, with traffic signal, at US 41 and Pelican Sound Drive, a second entrance on US 41 further south opposite the 7/11 store, and an entrance off of Williams Road. There will also be a connector road to the north. They are planning to include a 10 foot multi-use bike/ped path on one side of their internal road. The applicant will be providing a buffer along US 41 at a later date. For now, they will leave the current foliage to screen the undeveloped parcel, even though it is predominantly invasive plants. This project is located northeast of the intersection of US 41 and Williams Road and is located in the Village Center.